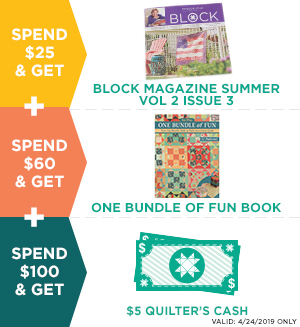 Hibernate and Create Bundle - Missouri Star Quilt Co. - Missouri Star Quilt Co.
With cool autumn winds blowing outside your window, settle in with a copy of BLOCK Magazine and Stitched Together Vol. 1 for an afternoon filled with inspiration and plenty of heartfelt stories from quilters like you! You'll also get a mystery fat quarter to add to your next project. Sounds like a lot of fun just waiting to happen! Contains: Stitched Together Book Volume 1 - Stories for the Quilter's Soul, BLOCK Magazine Early Winter 2016 - Vol. 3 Issue 6 and one mystery print fat quarter.